SKGOLD Hosting Review 2019: Is SKGOLD Hosting a Good Hosting? Web hosting vendor SKGOLD Hosting is committed to providing its customers with high quality, user-friendly, and reliable web hosting solutions at affordable prices. Privately owned Canadian hosting company SKGOLD Hosting was founded in 2010. It regards itself as a top-notch provider of web hosting and domain services targeting individuals and business of all kinds. The SKGOLD Hosting website is in English. SKGOLD offers a variety of user-friendly services that require little technical knowledge. The three Linux web hosting packages (including the Baby entry-level plan) come with a 60-day money-back guarantee, at least 300 MB of disk space, up to two MySQL databases, at least 500 MB bandwidth, unlimited email accounts, FTP accounts, PHP support, and free SEO tools. This vendor offers the Fantastico De Luxe auto-installer that makes it easy for non-experts to install popular application scripts. You also get an good 99.9% uptime guarantee, automatic cloud backups, and SSL certificates. With this hosting provider, you will be able to create and manage beautiful websites using more than 100 modern and unique templates, search-engine-friendly designs, and over 300 professional images. I have had an excellent experience using the free drag-and-drop website builder that comes with 40+ widgets and responsive designs. SKGOLD Hosting’s packages are offered at good prices with a 30-day free trial (to test-drive the services) and a 60-day money-back guarantee (which could get you out if it all goes wrong within the first two months). You also get one month free when you sign up for hosting on all plans except the Baby plan. Although this vendor reserves the right to change its prices at any time, your price will be locked for the length of your contract. 24/7 technical support is provided entirely online, with no telephone or email support offered at all. Existing customers can submit a ticket, but pre-sales prospect customers are encouraged to fill out a separate contact form instead. I filled out the “Pre-Sales Contact Us” form but received no response. 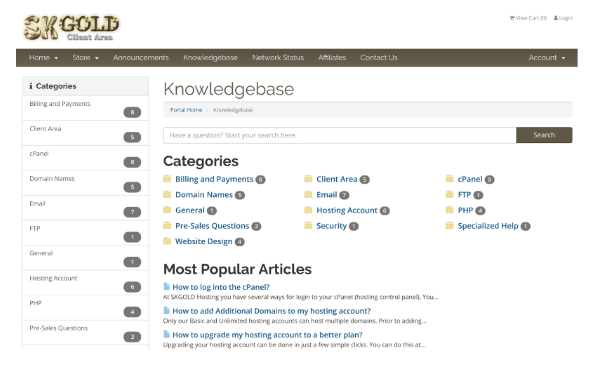 Oh well, at least I was able to learn more by checking out this company’s knowledge base. SKGOLD Hosting offers a good set of feature-packed plans that should appeal to you, as long as you’re comfortable with online-only support. Wondering how SKGOLD Hosting stacks up against other Web Hosting companies? Enter any other Web Hosting company and we will give you a side-by-side comparison.